2 Canoes, dock and swim float, Nordic Track, and stationary bike, outdoor firepit, horse shoe pit. Shoreline is not a beach per se, but sand underfoot/underwater, shallow at shore, gradually getting deeper, clean water, very inviting, great for kids. Drive-In movie theater nearby, Rick's Cafe on Long Lake Naples, lakeside dining and live bands. Point Sebago golf course. Gordon Family Reunion. We had a wonderful time in this beautiful house. 3 generations from 9 months to sixty five. 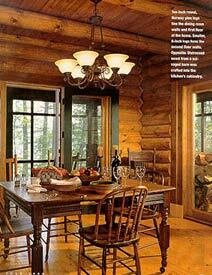 We swam, pointed at the moose, dined around the great table, fished, we caught and ate a beauty! 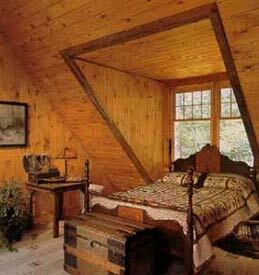 Day trips to Ogunquit, Attitash (means blueberry), Mt.Washington, and the beach at Lake Sebago. Midnight dips in the lake, hours canoeing and lots and lots of lobster. Thanks so much for allowing us to use your beautiful home. The velvet couches were wonderful for reading to babies, and your kitchen turned out some fine pancakes and bluberry pie from scratch. 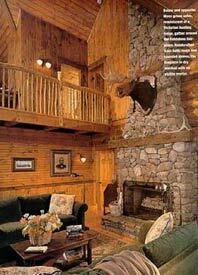 We will enjoy showing the Log Home Living Magazine feature to friends back home. Linda & Bob. 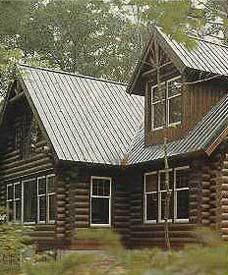 Canning Party, Jacksonville Fla. Great log cabin, great views. Great morning sun on the lake. Enjoyed canoe rides on the lake and around the island and stopped at the sandbar. Two of us did the Rattlesnake Mt. hike, Terrific views after a vigorous climb. Ate at Charlies twice, ice cream too. Blueberry picking for blueberry pies, pancakes and biscuits. Day trips to LLBean and Boothbay Harbour. Had a clambake too. Enjoyed peace & quiet at night, swimming and awsome warm days and cool nights. Hope to come back next year. Rich 69, Candi 55, Colleen 42, Jim 38, Ted 38, Tom 38, Christie 33, Jill 5. We all caught our first fishes, great snorkling, we saw lots of fish and a turtle. We enjoyed the great sandbar. Best of all, listening to the loons, and the all night card games, Whist, and Gin. Also, we enjoyed sitting by the fire toasting marshmallows. Amy 5, Emma 8, Sarah 10, Nick 10, Deb 43, Joe 43, Mary really old, and George 43. 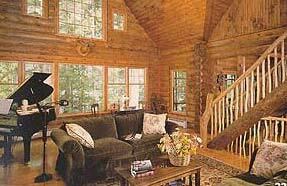 We stayed at this beautiful log home in August, 2002, and are looking forward to returning in 2003! 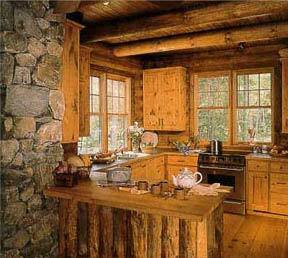 The home is beautiful- with open spaces and large rooms. 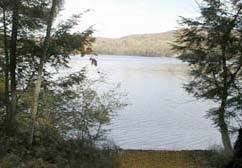 The grounds are secluded and quiet with a nice swimming area w/dock. We enjoyed swimming, fishing and canoeing. 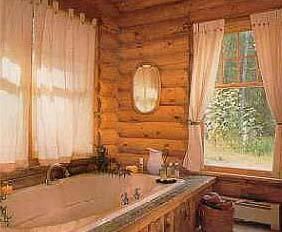 Within minimal driving distance are some great restuarants, blueberry picking and other activities. A great vacation site!!! Deposit: Deposit consists of 50% of entire rent and security deposit. Cancellations and Refunds: If cancellation happens after deposit is received, deposit is forfeited. Other Fees: Linnen and crib rental upon request.